In 2013 we had taken a trip offered by the Stanford Alumni Association through the British Isles. It was a cruise on a ship called the Island Sky. When we received a flyer from Stanford offering a cruise on the same ship to the exotic White Sea, we couldn't resist. 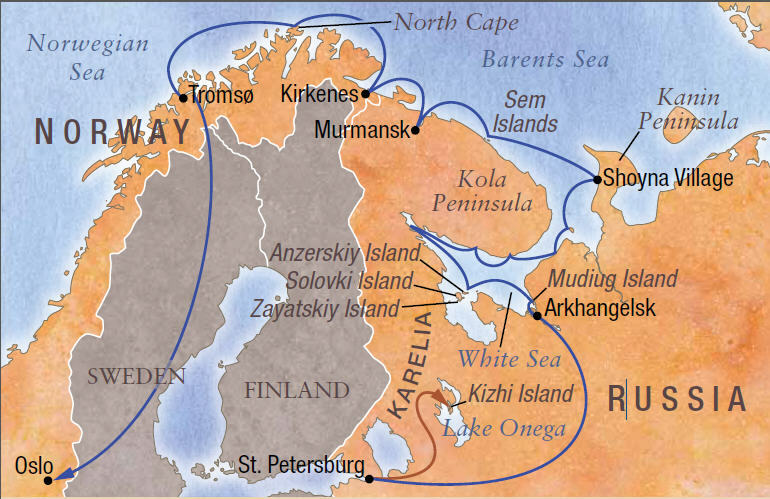 It was our first introduction to Zegrahm Expeditions, the tour provider, but we suspect it won't be our last. During the months between the time we booked the trip and its scheduled departure, we watched the relationship between Russia and the US deteriorate. For a while we wondered if something would happen to prevent the trip, but we were able to start as scheduled. The tragedy with Malaysian Airlines occurred while we were in Russia and we wondered if we would be greeted with hostility anywhere, but everyone continued to be welcoming. President Putin announced his retaliation against the US sanctions as we were preparing to leave Russia and we even pondered the possibility of being "held hostage," but such concerns were groundless. Nevertheless, we were glad to leave Russia and even gladder to get home. I've tried to make the narrative a complete summary, but I've used many links to other web sites to provide additional details and sometimes pictures. You can either stick with the basic narrative or explore the various links. At the time this album was created the links were all valid, but the WWW is in constant flux and that can change. If you encounter broken links, please send us some email. I took almost 3000 pictures of which nearly 1000 made the "first cut!" I have tried several ways to limit the expanse of this narrative, but I've finally given up and stayed with my standard day-by-day approach. There is still so much that is omitted! I did create an overview page with one or two highlights for each day. Click to visit our main Picture Album.